Probiotics are a group of friendly microorganisms that are similar to the ones found in your gut. Consuming foods or supplements that contain probiotics helps improve the balance of friendly bacteria in your digestive system, which improves immune health, digestion and the synthesis of vitamins, minerals and essential fatty acids. But when looking to add probiotics to your diet, it is important to look for certain ingredients. 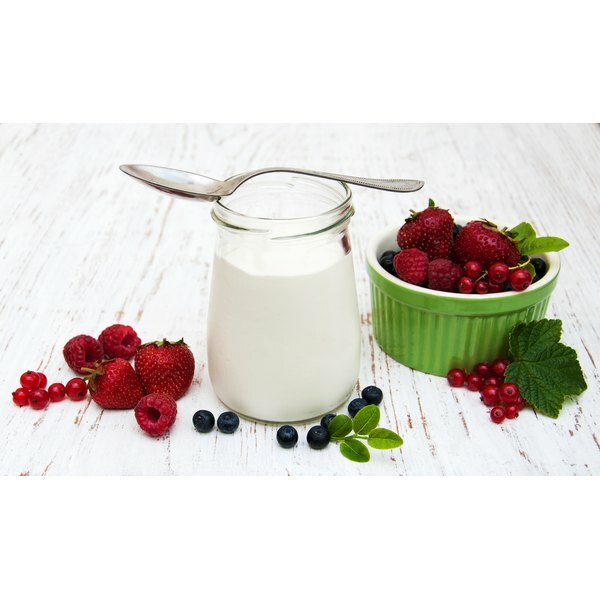 Lactobacillus is one of the more common probiotics found in foods. It might also appear on the label as Acidophilus or L. Acidophilus, or as Lactobacillus with another bacteria name such as Bulgaricus or casei. Lactobacillus is touted as a remedy for a number of disorders, including diarrhea, skin disorders, lactose intolerance, high cholesterol, yeast infections and urinary tract infections. However, it is most effective in treating diarrhea caused by viruses and medications. It is also helpful in the treatment of yeast infections. Bifidobacterium is another ingredient you might find on a label of a probiotic. Bifidobacterium is a group of microorganisms found naturally in your digestive system that can also be grown outside of the body. Other label ingredient names for Bifidobacterium include B. Bifidum, Bifidus and B. Breve. Bifidobacterium is recommended as a supplement to your diet when taking medications such as antibiotics that can decrease the number of these friendly bacteria in your gut. It is also used to prevent intestinal infections and diarrhea caused by antibiotics. Streptococcus thermophilus is another friendly bacterium used as an ingredient in probiotics. Streptococcus thermophilus helps ferment foods such as yogurt and mozzarella cheese. In your body, it is used to help treat gastrointestinal disorders and lactose intolerance. Many foods list probiotics as an ingredient on their label, including cereal, candy bars, juice and cookies. But to be sure that the food item contains adequate amounts of the friendly microorganisms, it is recommended that you contact the company directly, according to the website USProbiotics.org. Yogurts, including frozen yogurt, are a good source of probiotics, but you want to make sure the label clearly says "Live Active Cultures," which was developed by the National Yogurt Association to help consumers distinguish yogurts that contain live microorganisms and those that don't.